Growing up in regional Victoria, Anna Robb developed a love of theatre and design early in life. Deciding she wanted to do something different to her two brothers, who had moved to Melbourne, Anna chose to study her Bachelor of Arts (Design for Theatre and Television) (Honours) degree at CSU in Wagga Wagga. Anna is now General Stage Manager of The House of Dancing Water in Macau, China. Performed in the tailor-made 2000-seat Dancing Water Theater, The House of Dancing Water is one of the largest automated shows in the world. The show has 144 winches in its theatre grid and 11 automated hydraulic lifts that move through water to create a dry theatrical stage or a seven metre deep swimming pool (equivalent to five Olympic swimming pools) and many variations in between. Scenic elements are stored underwater underneath the audience seating and 22 scuba divers spend each show underwater driving these scenic elements and assisting in performer movement underwater. To give you an idea of just how big this production is, more than 500 cues are called by the show caller in 90 minutes and 83 crew members work backstage while 91 performers are onstage. The House of Dancing Water is performed 9 to 10 times a week for 48 weeks of the year. And at the heart of all this is Anna, who took time out of her busy schedule to share with us why she is so passionate about her work. At school I...loved sports and art and design and theatre studies. My childhood was...running around the hills of Mansfield and playing outside all day long. I loved camping and hiking and riding my bike. I wasn’t much of a girly girl. My best experience at CSU...I have many fond memories at CSU. Particularly the long days with my classmates building the theatre shows at the Playhouse. There was such teamwork and passion within the group that has carried through to my career. I am sure I would not be as invested in the industry if I had not had such a great start. My worst experience at CSU....Not having a car or much cash to spare. At university I was inspired …by all the other students who were studying different courses that had nothing to do with the arts. It was interesting to see what courses they were taking and how different they were to my chosen profession. I am still in touch with some of them today and they are doing great things. Today I’m motivated … by hard working people who excel at their profession, by my children, by my partner, Jay, and by trying to be the best version of myself I can be. In my profession it is important to…be consistent, confident and always be safe. When calling a show of this magnitude, things can go wrong very quickly and being decisive to protect the performers is of utmost importance. I am passionate about what I do...because running the show I work on is a challenge every day and each time I walk into the theatre, I never know what’s going to happen. Throw a group of 250 people from all different countries in the small country of Macau and you get chaos. I swear it should be a reality TV show. I never dreamed I would …be able to have children and have my dream job. I always thought I would have to compromise one or the other. Fortunately living in Macau allows me to do both. I am very lucky. The biggest influences in my life...are the women in my family. My mother, my grandmothers and my great grandmothers (three great grandmothers whom I was fortunate enough to know well) are all women of integrity and strength. When I think that things are getting hard for me, I think about the fact that both my grandmothers had nine children each and I think, “toughen up Anna”. I’m most proud of…the two children I have brought into this world. My greatest achievement is...completing the creation of the House of Dancing Water as Production Stage Manager while I was pregnant. 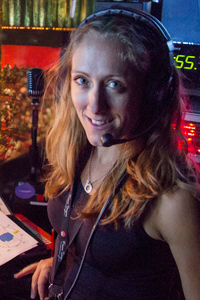 The best piece of advice I ever received...Someone once said to me, “Anna, no matter how much you get paid and no matter what your title, if you accept the fact that some days you are going to end up sweeping the floor to get the show up and running, you will be a good stage manager”. The thing I wish I had done but never got around to...I want to hike the GR20 in Corsica. It’s on my list to do. If I could do it all again...I would be a lighting designer. They spend less hours in the theatre than a stage manager. One last thing...growing up in Australia and having the chance to study at a tertiary level is more opportunity than many people get in a lifetime. Don’t waste it.